Hooked on Python's "wrist-friendly" syntax? Enamored of .NET architecture but equally appreciative of C#'s strong typing? Boo offers the best of three worlds. Unlike other development platforms, the .NET framework can mix and match code from any number of programming languages. For those who program in .NET, the universal code form known as Microsoft Intermediate Language (MSIL) is a lingua franca. If you can translate your source code into MSIL, you can combine it with, say, Visual BASIC.NET or C# to produce one executable. Indeed, given such flexibility, developers have adapted many popular languages to .NET. IronPython  is a full implementation of Python for .NET, and IronRuby  is a proposed .NET-ready implementation of Ruby. Also, you can find Java, Lisp, and Smalltalk for .NET. Moreover, if you don't like any of the existing programming languages, you can create your own. If you can consume source code and produce MSIL, the sky is the limit. In fact, that's the genesis of Boo . Hooked on Python's sparse, "wrist-friendly" syntax but enamored of the .NET architecture and the strong typing found in C#, developer Rodrigo Barreto de Oliveira set out to combine the best features of both – with just the right amount of Ruby – into something readily suited to iterative development. 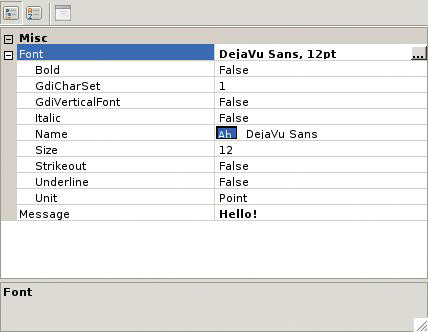 In this article, I help you get started with Boo and show you how to use the MonoDevelop IDE to write and test some Boo code  . Boo is available through an MIT-style license, which provides broad latitude for using the code and creating derivative works. The Boo Primer  is a well-written introduction to the Boo language. The constructs and syntax of each element are described in detail; you can also learn quite a bit by browsing the sample code provided with the Boo compiler and its test suites. As you study the Boo language, you will start to get a sense of how it works. Boo offers both a list and an array type. A list can vary in size, and an array is fixed in size. You can use either a list or an array to extract one, some, or all elements, and both can contain heterogeneous elements. Listing 2 demonstrates some similarities and differences between a list and an array. Both the list and array use brackets ( ) for indexing and slicing; a list is displayed with brackets, and an array appears with parentheses to differentiate. A slice can be a single element or a bounded or unbounded range. m[1:3] includes the element at index 1 and everything up to but not including the third element. m[:2] is the set of all elements up to but not including the second to last. An out-of-bounds access in either a list or an array yields an exception. Interestingly, a string behaves like a range and a list. Like Perl and Ruby, Boo also offers a hash to store (key, value) pairs. A struct (short for structure) is like a class – a struct can have instance variables and methods, but it is stored as a value instead of a reference. A method is an object, too, and it has its own methods. Making each function its own object has practical uses. For example, you can instantly run a function in its own thread by calling the method's own BeginInvoke() method. You can terminate the thread by calling the function's EndInvoke() method. Boo also provides a macro named lock to grant a thread mutually exclusive access to an object during an operation. Boo has other nice features, but the macro, which allows the creation of domain-specific languages, might be its most powerful feature. Python has minimal syntax and uses white space to connote program structure. Boo follows suit. Listing 1 is a Boo program that reformats text lines to fit within a specific width. As you can see from Listing 1, Boo is very spartan: no semicolons, no braces, no classes (if not needed), and no mandatory variable declarations. Just assign and go. But Boo is simple in form only. Type is enforced both implicitly and explicitly. Formal arguments can be typed, as you can see in the definition of the wrapLines() method. Otherwise, type is inferred. For example, the assignment lines =  implies that lines is a list. Similarly, nextBreak = columns infers that nextBreak is an int. Because o is instantiated as an object, the subclass of all types, it can reference any other type. This canonical example demonstrates polymorphism. However, if you declare i more narrowly at the outset, Boo catches an errant assignment. ERROR: Cannot convert 'string' to 'int'. Ruby and Boo have another language feature in common: Both support duck typing, as in "If it walks like a duck and quacks like a duck, it must be a duck." Or more to the point, if an object looks like a string, acts like a string, and responds to the same methods that an object of type string responds to, then it must be either a string, or a clever enough mimic to pass as a string. To use duck typing in Boo, use the eponymous type duck. Boo forgoes compile-time type checking on variables declared as a duck. fudd = "be vewy quiet"
Typically, you only have to specify a type when it is to your advantage. For instance, Boo provides method overloading, an added benefit of declaring the type of arguments. Otherwise, do not declare a type; let inference do the heavy lifting. The most common of programming types have succinct, lowercase names, such as object, int, string, double, and bool. More complex types are capitalized, as in List or Match. To use Boo, you must install the MonoDevelop integrated development environment (IDE), a suite of coding tools designed for C# and other .NET languages. The latest version of MonoDevelop is 1.9.2, a pre-release of the forthcoming MonoDevelop 2.0. Binary packages of Mono and MonoDevelop are available for a variety of Linux distributions and other platforms, including Mac and Windows, or you can build the software from source. To build from source, make sure your Linux machine has the typical suite of development tools required to build Gnome applications. Some other utilities and development libraries are also required: a Java Runtime, the Bison parser generator, the pkg-config utility, the Pango rendering library, the ATK accessibility library, the Gtk 2.0 libraries, the Curses library, some CLI bindings, and the GNU Library (glib) version 2.0 or greater. For the necessary packages, check your distribution's package manager. Next, download and unpack the tarballs for MonoDevelop and its dependencies. (See a comprehensive list of components on the Mono site .) Nine packages are required (Listing 3). A complete build takes about 30 minutes and yields the Mono engine, the nant build tool (similar in purpose to make), the MonoDevelop IDE, a debugger, and a panoply of Linux and .NET libraries. By default, all of the software is installed in /usr/local or its subdirectories. In each command, use ./configure --prefix directory_name to specify an alternate target, such as /opt/local. Now you have a complete working copy of the Boo compiler booc. To try it, build and execute one of the example Boo programs found in ./examples. Success! The sample, arrayperformance.boo, copies a large array and benchmarks the elapsed time. Also, you can test Boo directly in the Boo interactive interpreter, booish (Listing 4). At long last, you are ready to add Boo support to MonoDevelop (see Listing 5). A link to scripts that build the software for you can be found at the Linux Magazine website . First, launch the MonoDevelop IDE with monodevelop. The main window resembles Figure 1. To create a Boo application, click on Start a New Solution, click Boo, and select Empty Project. Next, pick a name for the project and a location in which to store it and click OK. On the next screen, enable Unix Integration (optional) and click OK. Now you should have a solution in the list on the left. 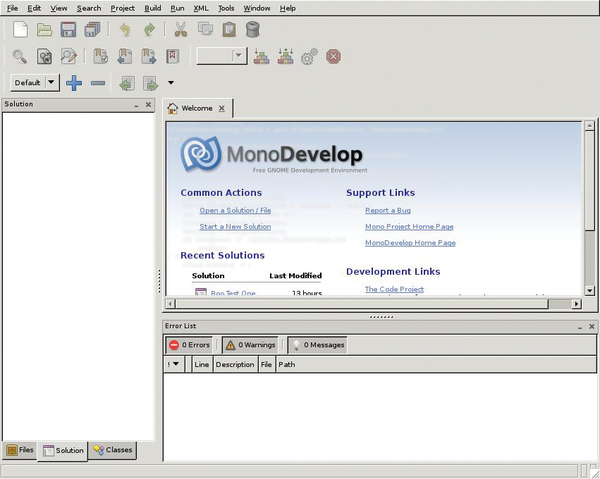 Figure 1: The MonoDevelop main window. Here, you need to choose the solution, right-click, and choose Add | New File…; next, choose Empty File and give the file a name, then click New. At this point, you are ready to edit Boo code in the main panel. The editor colors syntax as you type, and it automatically indents on the basis of context. And because you are in Mono, you can build on the .NET frameworks or any framework with a CLI binding, such as Gtk#. Now enter the code in Listing 6 in MonoDevelop, save the file, and choose Run | Run. Listing 6 produces the output shown in Figure 2. This example also demonstrates Boo classes. The phrase class PropertyEditor(Form) defines the class PropertyEditor and derives it from the Windows Form's class Form. The constructor() method is self-evident. The statements [property(Message)] and _message as string create a setter and getter method named for the property _message, which is a Boo string. The [property(Font)] statement is similar, although it is a font.